Ambulance EMS Inverter AC Power System combines a powerful DC to AC power inverter with an automatic battery charger/conditioner and a 30-amp AC transfer switch. When connected to shore power (AC utility power) the vehicle battery is charged, then automatically maintained in full charge condition. The shore power is automatically connected to the system AC output receptacle to supply power to the AC loads. 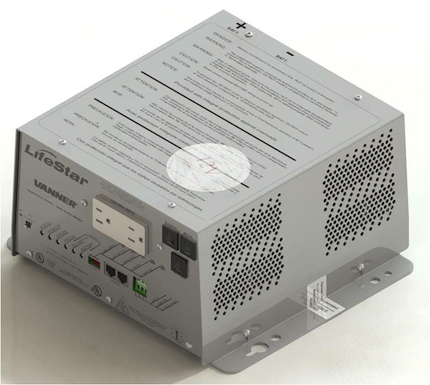 When shore power is disconnected (vehicle underway), the automatic transfer switch connectes the AC output receptacle to the power inverter, which obtains power from the 12 volt battery. The system contains a front panel LED indicator status panel and interface connector for the remote monitor/control units. A set of remote options allows flexibility in configuring the inverter system for specific needs. The optional IFM1 Interface Module enables the two remote status panels, system ON/OFF switch, and the Inverter Lockout Interlock to be connected to the system. Vanner, a market leader in developing innovative solutions for ambulance, provides outstanding engineering and dependability with state-of-the-art inverters providing critical DC power, inverter/chargers, emergency flashers and battery isolators. Vanner inverters are the industry standard and designed specifically for the EMS/Ambulance industry. Clients appreciate that our products are rugged, reliable and safe–as lives are depend on Vanner products to deliver power for auxiliary lifesaving operations, lighting, power and more.